MEPS IN THE European Parliament in Strasbourg voted yesterday to approve a reform of the Common Agricultural Policy (CAP) with a large majority voting in favour of the draft mandate to change the way in which direct payments to farmers are distributed. The draft mandate on the future direct payments was approved in parliament by 427 votes to 224 with 32 abstentions. Parliament backed Commission plans to cap direct payments to any one farm at €300,000, and substantially reduce payments to those receiving more than €150,000. Speaking to TheJournal.ie today, JJ Gallagher of the Irish Farmers’ Association (IFA) said that farmers are “very worried” about the impact this will have on their livelihoods. “We lost very few jobs in farming due to the downturn – it fared very well – and to see that happen is very frightening,” he added. Gallagher said that farming is keeping rural villages alive and these changes could have serious consequences on local economies. “There’s a chance that there will be a fierce reduction in the suckler cow herd as well, coming at a time when food scarcity is coming to fruition and it could have an impact on the export economy,” he said. “It would be a shame to see it damaged in that way so we’re depending on Minister Coveney to represent our interests”. Yesterday, in an interview with TheJournal.ie in Strasbourg, Fianna Fáil MEP Liam Aylward, who is a member of the European Parliamentary Committee on Agriculture, said the decision for the move to an area-based payment has already been made. He said that the vote yesterday was just the beginning of the process and the important question is how long Ireland will be given to make the adjustments. Aylward mirrored the IFA’s concerns that the changes could see significant amounts of money being taken away from productive farmers. However he said that with its report, the committee is trying to “give flexibility to member states to apply best the rules that have been put down”. While the way in which payments are to be distributed will be changed under the new policy, no member states’ farmers should receive less than 65 per cent of the EU average. Young farmers will a 25 per cent top-up payments for a maximum of 100 hectares and member states could also use more money to support small farmers. The final shape of the new EU farm policy will be decided by the European Parliament, EU farm ministers and the European Commission, in three-way negotiations which should begin in late March or early April. Email “EU approval of CAP reform leaves farmers 'in shock'”. 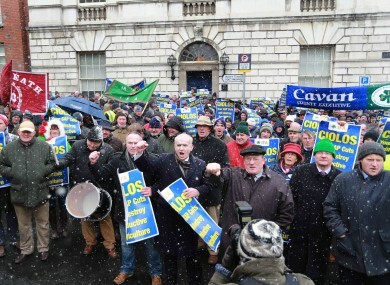 Feedback on “EU approval of CAP reform leaves farmers 'in shock'”.